Our Premium Quality Reversible Cuff French Cuff Dress Shirts come in a full range of fashionable colors and design, suitable for work, casual wear, and/or those special parties. They are made in Turkey from our 100% cotton mills. Quality and Comfort. Sizes Small - XXXL. Our slim fit dress shirts can be worn on any occasion. Modern and simplistic design with flair, Clean with a sharp look or our favorite the loud, get attention but clean look. We have something for everyone! Our Spread collar allows for a visually slimming while maintain a low profile casual style. Simple, Casual, and elegant, Long Sleeve French Cuff shirts for all occasions with the option of reversing the cuff and choosing the color/pattern you want for the occasion you are going for. Its like 2 shirts in 1! 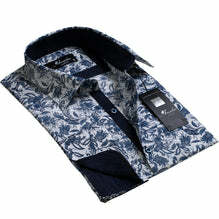 All Amedeo Shirts are made 100% imported premium cotton. All Amedeo shirts come in their protective Amedeo bag. Each product is packaged according to the pack size and type. Easy care and maintenance: simply machine wash and dry, warm iron if needed. Contact Us by Email: info@amedeoexclusive.com. Contact Us by Phone: (587) 520-8669. © 2019 Amedeo Exclusive. Built & Managed with Love by Ecomclips.